Vivian and I had a delightful time at meeting for worship this morning. Harvey has started the six-possibly-seven-days-a-week work schedule that is the holiday warehouse routine. Given that I'm on fumes in my bank account, we aren't feeling anything but grateful about the extra hours. Bonus: One of the friends at the meeting house gave us tickets to next weekend's NAACP luncheon, which we are very much looking forward to attending. I'm going for certain; Harvey will be there if he isn't working. This gift leaves me feeling really supported and loved and welcomed. 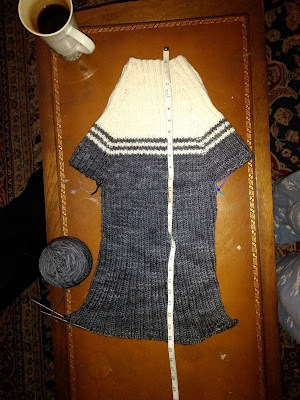 The Parisian Poorboy dress is coming along nicely. Earlier in the month I had it about two-thirds done, and it looked exactly as I wanted it too, mostly. 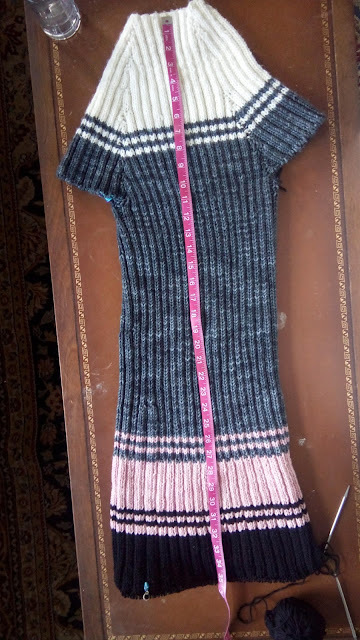 I decided the grey section should be much more the full body of the dress, so I ripped out a bunch of what I had knit so that I could scooch the pink farther down the hips. The First Incarnation, with pink stripes starting at the waist. I decided to drop the stripes to the hips. 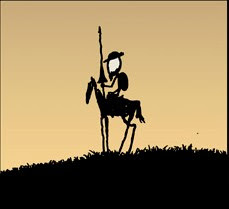 The First Incarnation on the body. Harvey's look of dismay when I told him I was going to rip out over five inches of stitches was priceless. He saw me do this the first time when I was designing Vivian's dress last year, but it's still a shock to him. The women at the yarn shop were equally horrified when I told them, but I picked up the additional skein of grey and went home to set about getting what I had on the needle to match what was in my mind. It didn't take long for the grey to be what I envisioned, and then I started adding the pink back in. 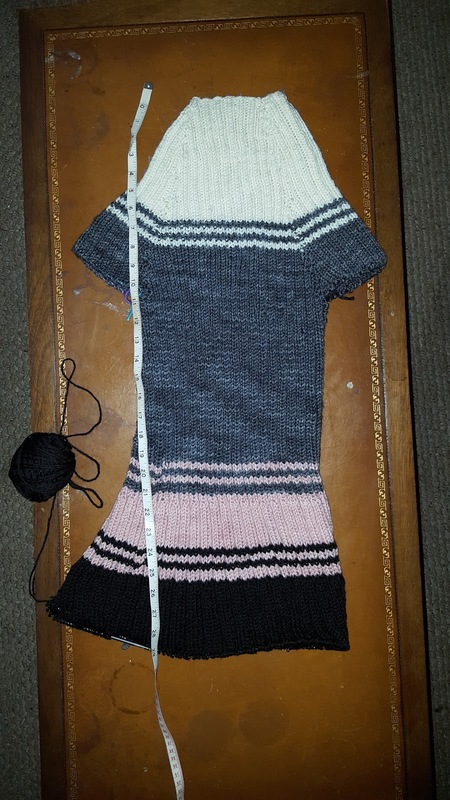 This time around, the pink patch is the same three inches that it was the first time, but starts seven inches lower to balance the design, and I like it much better. 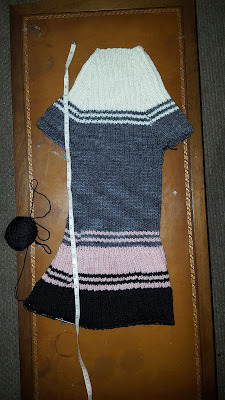 The black is coming along too, and I'm almost finished with the body of the dress. 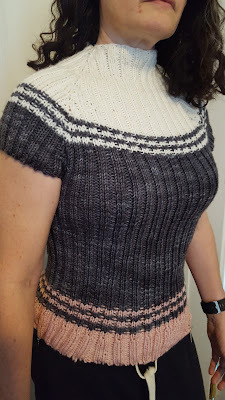 I expect I'll be done with the sleeves no later than next week. And yes, I do have a beret to wear with it. The Eiffel Tower is around here somewhere, right?